I originally posted this summary in the Galicia mailing list back in September. It is more or less the same as what I posted then, but will the added mention of the new familysearch index when went live just recently. In an attempt to help those who had family in Belgium at some point before and during WWII, I’d like to summarize the primary archives available and how to best access them (in my experience). 1) The State Archives in Brussels (http://www.arch.be/), which holds the ‘Vreemdelingenpolitie persoonlijke dossiers’ which are files that were kept by a special department of the police on all immigrants entering the country. This was a centralized archive for the whole country, and in theory all interactions by immigrants with all levels of government, down to the local cities, was forwarded to this central archive. 2) The Felix Archives in Antwerp (http://www.felixarchief.be/), which holds the local versions of the immigrant files as above. Not all cities kept these files, but Antwerp did, and it is an important resource. It is especially important for those families whose relatives went to Antwerp before 1900, as the central archives in Brussels destroyed some of the older files in 1900 to make room for new files, and anything before 1900 may only exist in the local archives like the Felix Archives. 3) The Jewish Museum of Deportation and Resistance (JMDR) is a museum and archive set up in Mechelen, Belgium — the location where Belgium’s Jews were collected and deported to Auschwitz in 1942. The archives hold a number of interesting collections, the most important being the registers of all Jews in Belgium done in 1940 by the Belgian gov’t, at the request of the occupying German forces, the later registers done by Judenrat members in 1941 and the deportation lists from 1942. They also state on their web site that they are in the process of digitizing the immigrant files from the State Archives listed above, but this may only be the records of those deported, and may not include those people who got out of Belgium before the Germans arrived. So first the State Archives. These files are files that were kept by a special department of the police on all immigrants in the country. If your family moved from Galicia to Belgium at some point before the war, chances are there is a file on them here. The files can range in size from a single page up to dozens of pages. I have one record that is over 80 pages. 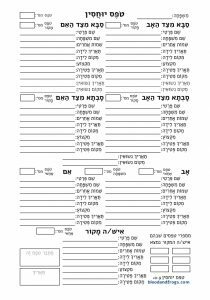 The files contain all kinds of information, usually including the names, birth year and birth location of the parents of the person whose file it is. The files contain all interactions with the government, so may include letters from consulates on the person’s behalf, letters from relatives already in Belgium, dealings with the police, etc. The files can run well past WWII if the person continued to live in Belgium, or even returned to visit later. If your relative lived in Belgium in the 1920s and 1930s you can expect more than one photo of them in the files as well. In theory, everything from the local archives from the city your relative lived in should also be in these files, but as mentioned this is not always the case, and in particular if your family moved to Belgium before 1900 you should track down the local archives as well. This collection was once held in a different archive that provided the records for free to family members, but this is no longer the case. You need to pay for all copies of documents. If the number of pages are small, they can be provided to you digitally online. If the number of pages is large, they will need to mail you CDs with the files on them. One other expense is that if you want to pay for these copies from outside of Belgium, they require a bank transfer, so you’ll need to factor in the international bank transfer into the total cost. My bank charges $35 for this service, which the last time I ordered files was well in excess of what the archive itself was charging me for copying the files. To access these records, you can send in a request to archives.generales @ arch.be, and make sure to include in the subject ‘with regard to Section 5’ so it gets to the right department. 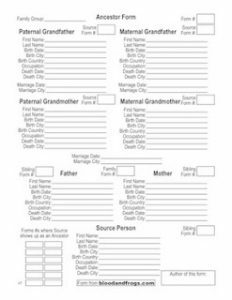 When you send in a request, make sure to include as much information about the people that you have, such the full name, birthday, town of origin, name of spouse including maiden name, etc. The more information you provide the better. The index to this archive is on cards, and there are millions of them, so the more information you provide, the easier it is for them to look up the information. The maiden name is very important, as sometimes a record might be listed under the wife’s name instead of the husband’s name. Some people have suggested in the past that you need to show direct descendency from the relative to access their records, but I have not found this to be the case. You will be directed to an archivist working in the right department, and they will help you to locate the files on your relatives. Once they have been located, you can choose to order copies of the files. One thing to keep in mind is that on the front of these file folders, the police frequently wrote down the names and file numbers of related people. So for example, it might list the file number of the person’s parents, or a sibling, or even occasionally a co-worker. Before ordering copies, you should ask the archivist if they can send you the names and files numbers lists on the front of the files they have found, so you can determine if any of the related files are also of interest to you. In many cases I have found people through these related files that I didn’t even think to look for at the beginning. Once you’ve come up with the list of files you want you will be directed to the reproduction services department and you will e-mail them the list of files you want and after a little bit of back and forth to determine how you want them sent to you and in what format, they will send you an e-mail with a link that links back to their web site with an invoice for the whole order. You are expected to transfer the amount in Euros to their bank and include the confirmation number on the invoice in the bank transfer information. Once they verify that they’ve received the funds, they will send you the scanned files. Keep in mind that if you’re going to be ordering a lot of files and having them sent on CDs, you can ask them to scan to TIFF instead of JPEG if you want. They don’t like it, but they will do it if pressed. UPDATE: This section is mostly inaccurate at this point since Felix Archives seems to have eliminated their browsable index of the records now that the index is searchable on FamilySearch.org. I’ve left the post, but the instructions for browsing the indexes on the Felix Archives site will no longer work. Many if not most Jews in Belgium lived in Antwerp (Anvers/Antwerpen) and this leads to the Antwerp city archives, called the Felix Archives. The web site is at: http://www.felixarchief.be/ and is in Flemish (Dutch). If you don’t speak Flemish, I recommend using a tool like Google Translate. If you use Google’s Chrome browser, or if you have the Google Toolbar installed in Firefox or IE, then you can have it automatically translate each page as you navigate the web site, which makes it very easy. For the main page, select ‘Uw huis, uw familie, uw stad’ from the left-side menu, select ‘Familieleden’ and then ‘Inventarissen en indexen’ and then ‘Vreemdelingendossiers’. This will bring you to a page that lists the indexes to the files they hold on immigrants from different periods – 1840-1874, 1875-1885, 1886-1900, 1901-1915 and 1916-1930. Keep in mind that the actual archives extends to 1970, but only the indexes up until 1930 are available, for privacy reasons. The reason why the archive has put these indexes online while most archives do not do so, is because they offer no research from their staff at all. You cannot ask them to find records for you, you must do it yourself. Indeed, even if you find the records, you need to have someone physically go to the Felix Archives reading room, get the appropriate microfilm, find the record, and either print it or scan it to a USB hard drive. The good news is at least copying to a USB drive is free, so if you can find someone to go, there are no direct expenses involved. Once you select a time period, you select a letter of the alphabet and then it shows the different index pages for that letter. These are JPEG images of hand-written indexes to all the files. Try looking up married couples by both the husband’s name and the spouse’s maiden name. When you find a person in the index, write down the file number. One new tool available for searching for these file numbers is the new familysearch.org website which has computerized these index files. When searching the site, you may find a hit in these index files. Clicking on the link will allow you to view the image of the index page, and then record the file number. It doesn’t allow browsing like the original site, but it might be a good place to start, after which you can go to the original site and browse the files to see if you can find other relatives in the index. In the PDF, look for the correct file range that includes your file. Starting on page 7 it lists all the files and which microfilm they are on. For example, the first line shows that files 1 through 59 are on Microfilm 2,234,925. It also shows where that microfilm is located – in cabinet 3, drawer 5. This is how you will locate the microfilm in the archive reading room. If you look on the web site you can reserve the microfilm for a specified time so you know you can get to work right away when you arrive. Don’t forget a USB drive. Go there and select the forum called ‘Opzoekingen’ towards the bottom. This is a forum where you can post a request for someone to send you a file. You should include the file number, the person’s name, the microfilm number and its location in your posting. I tried this and after about a week someone e-mailed me the file I was looking for. Of course, if you have family or friends that live in Antwerp, you might ask them to go to the archives and make the copies for you, especially if there are a lot of files that you’re interested in, since the people on the forum are volunteers doing it on their own time and may not be able to copy lots of files from many different microfilms. Now for the JMDR (http://www.cicb.be/en/home_en.htm). The first thing to keep in mind about this archive is that it only holds records from 1940 when the Germans occupied Belgium through the end of the war. If you had relatives in Belgium before the war, but they managed to leave before 1940, it is unlikely that you will find anything here. After the expenses involved in the State Archives, and the difficultly accessing records in the Felix Archives, the good news here is that they will look up records for you here, and they will send them to you by e-mail for free. To have a search done of these archives, you should e-mail Ms. Laurence Schram (laurence.schram @ cicb.be) and ask her to look up relevant files on your relatives, again giving as much information on the people as you can – including maiden names for spouses and dates and locations of birth for everyone. She will respond with whatever files they manage to find. In my experience this took only a few days. I hope this has been a helpful summary. Please post responses on your own experiences with these archives if they differ in the comments, and if I’ve missed anything please let me know. UPDATE 3/29/2011: It appears that now that the images of the Felix Archive indexes are searchable on FamilySearch.org, that they are no longer browsable on the Felix Archives site itself. This is disappointing because it makes it exceedingly difficult to browse them effectively. You can view the actual index images on FamilySearch.org, but it’s over 5000 pages with no navigation aid. UPDATE 8/15/2011: My own Felix Archives index browser is now up at trauring.net/antwerp. UPDATE 1/1/2015: This article is not being kept up-to-date, and much has changed. For one, the actual files from the Felix Archives are now on FamilySearch, although not yet searchable. I will keep the Belgium page in the menu up-to-date as best I can, so check there for updates if you are interested in these records. The felixarchief told me that they’re working on an own computerized index. Regarding the costs for copies of scans in the central state-archives of Belgium, it is always cheaper to go there yourself if you can. You can buy a membership of 15 euro per year and then photograph for free with your own photo-camera. The daily maximum of files you may request per day is 25. Regarding your updated note (“UPDATE 3/29/2011”) that the index is not browseable anymore on the website of the felixarchief, this is not correct. you still can browse them via this link: http://zoeken.felixarchief.be/zHome/Home.aspx?id_isad=87085. Drill down in the menu to get to the year span you’re looking for. My personnal advice would be to use familysearch to search in the index. I’ve got very good experiences with using the searchable index on FS. The volunteers from FS did indeed spell transcribe the index wrong, but that can very easyli be checked when you click on the image of the record in FS. Perhaps it’s just me, but I still couldn’t browse the image files with the link you sent me. It seems perhaps you need an account on the web site? It also couldn’t hurt to speak Flemish to navigate the site. In any case, this article is out of date, and I will be updating it in the future (after the Jewish genealogy conference in DC in a few weeks). You do indeed have to logon when you want to download the files. I like what you did, indeed quicker. Do you speak Flemish (Dutch)? What are your interests in Belgium? If you’re here, we can may be meet one time. Unfortunately I don’t speak Flemish. It would certainly make research in Belgium easier. A large section of my family (including my grandfather, great-grandfather and gg-grandfather) lived in Antwerp between the two world wars. A few lived in Antwerp even earlier (in the 1890s), and some cousins still live there today.